The “Made in Japan” enameled cast-iron pot “Vermicular", directly from the manufacturer to you. Select your country of destination and quantity for an estimate of the shipping fees. I have confirmed the following information. "This book is included with a pot for free." Your shopping cart cannot exceed 100 kg. Your shopping cart is full and cannot contain more items. Proudly presented by our Customer Service Department, this recipe book is enclosed for free with every pot, because it is indispensable. 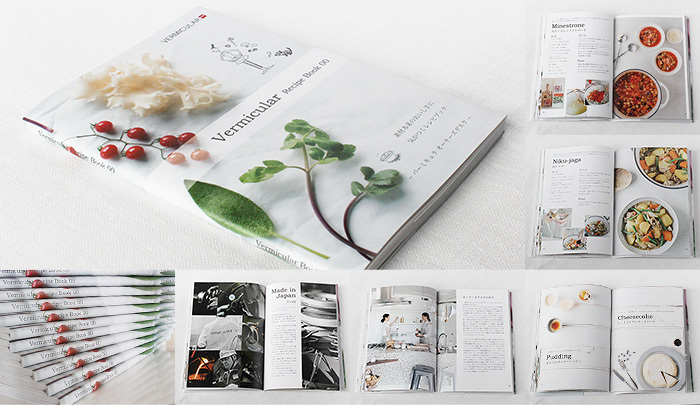 To make the most of your Vermicular pot, this recipe book contains 22 recipes with simple procedures to bring out the food's taste. Just follow the instructions to master Vermicular's techniques. From the history of Vermicular to the presentation of the manufacturing process, you'll know everything about Vermicular! Your order will be dispatched within one week. Parcels sent with FedEx arrive at least 2 days after dispatching.